An astonishing untold story from the nineteenth century—a “riveting…engrossing…‘American Epic’” (The Wall Street Journal) and necessary work of history that reads like Gone with the Wind for the Cherokee. 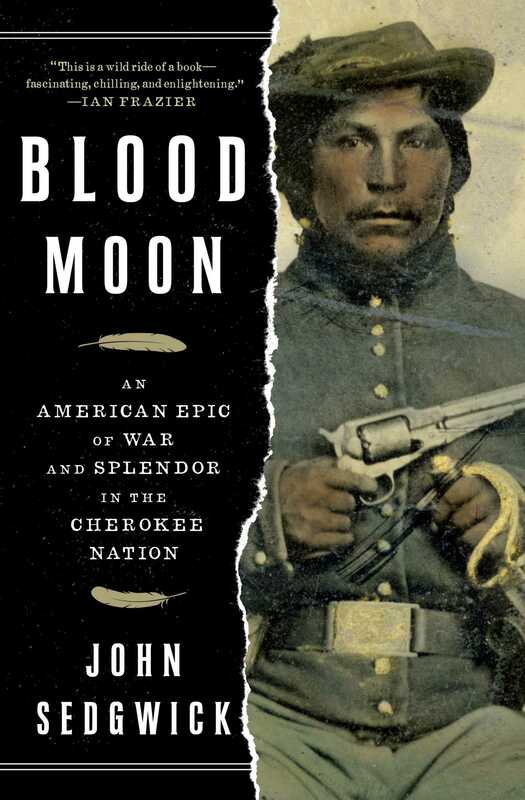 “A vigorous, well-written book that distills a complex history to a clash between two men without oversimplifying” (Kirkus Reviews), Blood Moon is the story of the feud between two rival Cherokee chiefs from the early years of the United States through the infamous Trail of Tears and into the Civil War. Their enmity would lead to war, forced removal from their homeland, and the devastation of a once-proud nation. One of the men, known as The Ridge—short for He Who Walks on Mountaintops—is a fearsome warrior who speaks no English, but whose exploits on the battlefield are legendary. The other, John Ross, is descended from Scottish traders and looks like one: a pale, unimposing half-pint who wears modern clothes and speaks not a word of Cherokee. At first, the two men are friends and allies who negotiate with almost every American president from George Washington through Abraham Lincoln. But as the threat to their land and their people grows more dire, they break with each other on the subject of removal. In Blood Moon, John Sedgwick restores the Cherokee to their rightful place in American history in a dramatic saga that informs much of the country’s mythic past today. Fueled by meticulous research in contemporary diaries and journals, newspaper reports, and eyewitness accounts—and Sedgwick’s own extensive travels within Cherokee lands from the Southeast to Oklahoma—it is “a wild ride of a book—fascinating, chilling, and enlightening—that explains the removal of the Cherokee as one of the central dramas of our country” (Ian Frazier). Populated with heroes and scoundrels of all varieties, this is a richly evocative portrait of the Cherokee that is destined to become the defining book on this extraordinary people. This is the last big surprise of the Civil War: It was fought not just by the whites of the North and South, and by the blacks who mostly came in after Emancipation. It was also fought by Indians,I as many as 30,000 of them, from the Seneca and Shawnee of the Northeast to the Creeks and Seminoles in the Southwest, nineteen tribes altogether. They fought at Second Bull Run, Antietam, Wilderness, Spotsylvania, and Petersburg in the East. But most of their battles were fought west of the Mississippi, beyond the range of the eastern newspapers that covered the war. While the Indians were skilled as scouts, trackers, horsemen, and sharpshooters, their greatest value may have been their fighting skills. Shaped by a warrior culture, most were used to violence, and they took to battle. Their long black hair spilling out from under their caps, their shoddy uniforms ill-fitting, their faces painted in harsh war colors, they surged into battle with a terrifying cry, equipped not just with army-issue rifles but also with hunting knives, tomahawks, and, often, bows and arrows. Even when mounted on horses, they exhibited a deadly aim, and their arrows sank deep, leaving their victims as much astonished as agonized. They’d close fast, whip out a tomahawk to dispatch their man, then pounce on the corpse with a bowie knife to shear off a scalp to lift to the sky in triumph. The New York Tribune fulminated against an “Aboriginal Corps of Tomahawkers and Scalpers” among the rebels, but President Jefferson Davis was not embarrassed enough to order his Indians to stop. The natives killed as Indians, and they often died as Indians, too. When one dwindling band of sharpshooters, fighting for the Union at Petersburg, Virginia, in the yearlong siege at the close of the war, found themselves out of bullets, surrounded by a tightening ring of Confederates, they lifted the blouses of their uniforms over their heads and chanted their tribal death song until the end came. If that is the last big surprise, another one lies hidden within it—about the mysterious behavior of the Cherokee in the conflict. Of all the tribes that fought in the Civil War, the Cherokee were one of the very few to come in on both sides, and, of those few, by far the most notable. The internal nature of their own conflict doubled the slaughter, and also drew the fight into their territory, bringing more sweeping devastation. Nearly a dozen battles were fought on Cherokee land, more than on any other Indian territory, starting with Caving Brooks in 1861 and Cowskin Prairie the following year; continuing through Pea Ridge just outside it, the greatest pitched battle in the West; and running through other battlegrounds that have been ignored by history. By the time of the surrender in 1865, the war had devastated the Cherokee Nation. At first, virtually all the Cherokee sided with the Confederacy, identifying with the Southern plantation owners, and proud of the black slaves they themselves had bought to pick their cotton. And, complicit with the state of Georgia, the Union had been responsible for the land theft that had cost them their ancestral territory and packed them west in the forced migration known as the Trail of Tears three decades before. But why did the Cherokee not stay united against a common enemy? How could they have divided against themselves? To answer this, we need go back three decades to the terrible winter of 1838 and the issue that would never go away. Removal—the cruel shorthand for the Trail of Tears—was to the Cherokee Nation what slavery was to America, an issue so profound as to be bottomless and unending. To the outside world, it pitted the Cherokee against Andrew Jackson and his nefarious Indian Removal Act. To the Cherokee themselves, the matter was more complicated and far more divisive. The Cherokee Nation did not stand as one against the threat of removal; it stood as two, one side agreeing that, given the relentless white encroachment, the Cherokee had to go, and the other insisting that they stay forever, come what may. Stay or go—the question could not have been more essential or more agonizing. On this, there could be no compromise. Follow the past, or chase the future? Hold to tradition, or start afresh? Philosophical as these questions might seem, they were as real as children, as houses that had been built by hand, as crops that had been teased from the earth, as the deer that gamboled in the forest, as the sun that rose over the mountains. The two sides were given body and voice by two proud Cherokee who loomed over the great debate like two great peaks on either side of a valley split by a raging river: John Ross and a man known as The Ridge. One the longtime principal chief, the other his primary councillor, and then his fiercest opponent. Their philosophies and personalities were so distinct as to name the two political parties that rose up over the issue. The Ross Party and the Ridge Party. One to stay, the other to go. Everything about them expressed their differences. The Ridge—short for He Who Walks on Mountaintops—was a big, imposing, copper-skinned Cherokee, a fearsome warrior turned plantation owner, whose voice quieted any room, and whose physique awed anyone who crossed his path. Smaller, almost twenty years younger, Ross was descended from Scottish traders and looked like one: a pale, unimposing half-pint who wore eastern clothes, from laced shoes to a top hat. If The Ridge radiated the power of a Cherokee who could drop a buck at a hundred paces, Ross could have strolled into an Edinburgh dinner party without receiving undue attention. Tellingly, The Ridge spoke almost no English, and Ross almost no Cherokee. Raised at either end of the string of Cherokee settlements from Tennessee down into Alabama, they were each a combination of Cherokee and Scottish, but in radically different proportions, and so demonstrated the startling variety of a seemingly homogeneous population: Cherokee skin ranged from a glowing tan to parchment white. In adulthood, the two men emerged as the two great leaders of the nation, statesmen both, united in their devotion to their Cherokee heritage, although no two men could have seen it more differently. Together, they created the first national Cherokee government, with a constitution, a legislature, and a supreme court, which certified the Cherokee as the most “civilized” tribe in America. In those halcyon years of the 1820s, the two worked together in backslapping harmony. It wasn’t hard to picture them, on a warm evening, sitting together in the shade of the elms under the porch of The Ridge’s fine house, sipping whiskey, although both professed not to drink it, and laughing into the night. But President Andrew Jackson’s hard push for removal touched something in them—a tension over whether to resist or to accommodate—that set each against the other, permanently. What started as an honest disagreement between friends developed into an active distrust that hardened into antagonism and then became a blinding hatred that consumed everything. A blood feud, in short, that went from personal vendetta to clan war to a civil war that swept through the entire Cherokee Nation before it got caught up in the even greater cataclysm of the American War Between the States. It was Ross against Ridge, but of course it was much more than that. It was a great battle over the truth about who the Cherokee people really were. The times had given the Cherokee such a shake that they’d lost track of themselves. Were they a people of the mountains, believers in the Great Spirit, attuned to the flight of a hawk across the sky? Or were they a people who’d largely abandoned their ancestral past, ready to start over with modern ways? Did their passions still run to the wild—or to the bright promise of industrial civilization? Did they want what the Cherokee had always wanted, or did they seek something new that would make them new? Identity should be obvious, the face in the mirror. But in their own uncertainty, the Cherokee turned to their leaders to tell them what they thought they were. Two leaders in particular. And, of course, John Ross and The Ridge saw wildly different things—tradition-bound for one, enterprising for the other—and when they described these, such was the power of their telling that the differences grew, and the two visions became so distinct there was no reconciling them: it was one or the other. And then it got even worse. Each of these two great men grew monstrous in the other’s eyes, and so did his ideas, and, following suit, the Cherokee Nation broke into two wrathful countries, each bent on annihilating the other before the other could annihilate it. As for the two men behind all this—things went no better for them. And that was the tragedy, right there. Their differences might have added to their understanding and joint strength, but led instead to division and acrimony—and ultimately to a disaster that was all the more excruciating because they had inflicted it on themselves. Their tragedy became the tragedy of their own nation, and also the tragedy of the greater nation they so uneasily inhabited. The tragedy did not begin with removal—that was simply when the sorrows hit hardest. It began earlier, at The Ridge’s birth just before the American Revolution, although its sources could easily be tracked back even earlier. And it took its shape as the Cherokee Nation did, its aspirations rising even as its borders were being squeezed by the settlers pushing in on every side. The resulting pressures on the Cherokee were tremendous, but hardly unique. Their story was the story of all Americans, really, as everyone in this land of emigrants tried to fit into a foreign nation. The difference, of course, was that the Cherokee were not emigrants; they had been here all along. By rights, everyone else should have been trying to get along with them, not the reverse. So, on top of all the other brutal hardships the Cherokee faced in being forcibly removed from their land, there was this one, which was possibly the worst of all: a terrible, grinding, and utterly legitimate sense of injustice that they should have to endure such suffering. I. I use the now somewhat antiquated word “Indians” because it was universally accepted by the country’s indigenous people and everyone else during the period of this book. I mean no disrespect.